Recently, the AEES Recruitment 2018-2019 Notification is released by the Atomic Energy Education Society. Nowadays most of the people are preferring the Teaching Field. For all those contenders the 50 PGT, TGT, PRT Vacancies will be very helpful. So, all the interested contenders can take a deep look at the current article and thoroughly verify the crucial information. Moreover, we have included some of the details like Application Fee Details, Education Qualification, Age Details, Age Relaxation, important dates to apply for AEES Recruitment 2018-2019, Post-Wise (Post Graduate Teachers, Trained Graduate Teachers and Primary Teachers) Vacancy Details, Steps to apply for Atomic Energy Education Society Recruitment 2018-2019 etc in the below sections. So, just go to the below sections and apply before 7th April 2018. Waiting for Teacher Jobs? Then AEES Recruitment 2018-2019 Notification is the golden chance. Right now, all the eligible candidates are very busy in applying for Atomic Energy Education Society Recruitment 2018-2019. And most of them are unable to gather all the essential information in a single place. For the sake of people, we have captured all the stuff and arranged in a single place. So, you can get the 50 PGT, TGT, PRT Vacancies 2018-2019 details from this article. Also, remember that only eligible contenders need to apply before 7th April 2018. Moreover, the authority of Atomic Energy Education Society invites the Online Applications for the candidates. Therefore, all the willing people need to apply only through Online Applications. Furthermore, information is arranged in the below paragraphs. We have collected these AEES Recruitment 2018-2019 Notification Details from the official web portal that is www.aees.gov.in. So, without a doubt just refer the entire article and gain genuine news. We all know that the Education Qualification is different for each post. So, Master’s Degree from any recognized institute or University along with 50% of marks and B. Ed. degree from a recognized institute or university in appropriate subjects is the Education Qualification for PGT Post. And, those who had done their Three years Bachelor’s Degree from a recognized Institute or University with a minimum of 50% marks in the relevant subjects and B.Ed. degree and also you people need to qualify for Central Teacher Eligibility Test is the Education Qualification for TGT Vacancy. Moreover, for PRT Post the Education Qualification should be done their Senior Secondary Higher Secondary School Certificate Examination or Intermediate or its equivalent with 50% marks. Therefore, these are the Education Qualification. The minimum age to apply for AEES Recruitment 2018-2019 is 30 Years and the Maximum Age is 40 Years. Actually, the authority of Atomic Energy Education Society is specified that there are separate Age Details for Post Graduate Teachers, Trained Graduate Teachers and Primary Teachers Vacancies. And the Upper Age Relaxation is also available. For SC/ St candidates the relaxation is 5 Years. For Personal with Disabilities contenders, the relaxation is 10 Years. 13 Years for OBC PWD candidates at the same time 3 Yrs Years for OBC contenders. Therefore, we hope all the category candidates can get the detailed upper relaxation info from this section. Also, we suggest the candidates that pay an application fee before the closing date. For General/ OBC contenders the Application Fee must be Rs. 750/-. And remaining categories like SC/ ST/ Women etc there is no application fee. Everone knows that the competition for Teaching Jobs is very heavy. 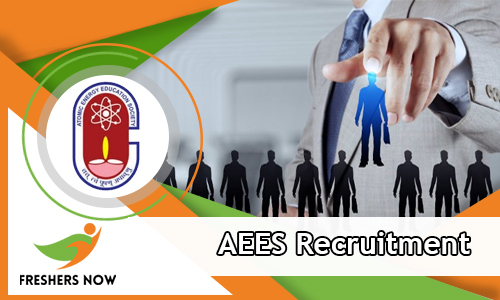 At the same time, the authority of Atomic Energy Education Society is mentioned about the Selection Procedure details in official AEES Recruitment 2018-2019 Notification. So, all the contenders those who had submitted their Online Applications before the closing date need to face Written Exam and Skill Test. So, you can get complete Written Exam scheme on our website. Moreover, the competition for written test is very heavy. Therefore, to crack the competition you people need to work harder. And most of the people are asking us to provide the Syllabus, Exam Pattern and Old Papers. For that reason, we have created separate posts and shared on our website. All the interested contenders can get it from our website and download the complete material at free of cost. So, check the post wise vacancy details in a tabular format here. Definitely, the officials of Atomic Energy Education Society will pay the best pay for the selected contenders. Therefore, the authority is waiting to give the good salary for the selected contenders. You have to attend for the rounds on scheduled dates. Moreover, as soon as possible the exam dates will be available in the official web portal of AEES @ www.aees.gov.in. Post Graduate Teachers (PGT): Master’s Degree from any recognized institute or University along with 50% of marks. And B. Ed. degree from a recognized institute or university in appropriate subjects is the Education Qualification. Trained Graduate Teachers: Bachelor’s Degree from a recognized Institute or University with a minimum of 50% marks in the relevant subjects. And B.Ed. degree and also you people need to qualify for Central Teacher Eligibility Test. Primary Teachers: So, the Intermediate or its equivalent with 50% marks. Download the AEES Recruitment 2018-2019 Advertisement from the above link. Kindly visit our source freshersnow.com to get the accurate information.